(Boston, MA) Addiction will kill everything you love and then it will kill you. In the 1950’s and 60’s drug dependency, not unlike depression, was considered a moral failing. The US govt. chose to ignore the plight of its people. Today, the opioid epidemic rages around us, silently killing thousands of Americans every day. The occupants of the White House would prefer to pretend we’re living in the 50’s. While the President is very proud to have invented and solved the “opioid crisis emergency” in one afternoon with a press release, updates are nonexistent. In fact the Feds haven’t updated their site since June. Cliff Odle’s Lost Tempo tells us more about the consequences of opioid abuse in 100 minutes than Trump’s administration has in two months. In Lost Tempo jazz savant Willie “Cool” Jones (Omar Robinson) lapses into memories of his troubled past at Mitzy’s Jazz Kitchen. In the present, he’s “clean” and attempting to put out a new album. In the past, he’s an arrogant star crippled with self-doubt. He’s looking for a new sound in all the wrong places. Rather than cope with his insecurities, he projects them onto his band and loved ones. Evelyn Howe, Miranda Adekoje, Arthur Gomez, Mishell Lilly, Kinson Theodoris, and Charles Linshaw complete the cast. This is a gut-wrenching piece of artistic disobedience. Odle’s play incorporates jazz compositional theory, civil rights, women’s rights, and religious freedom in one script. 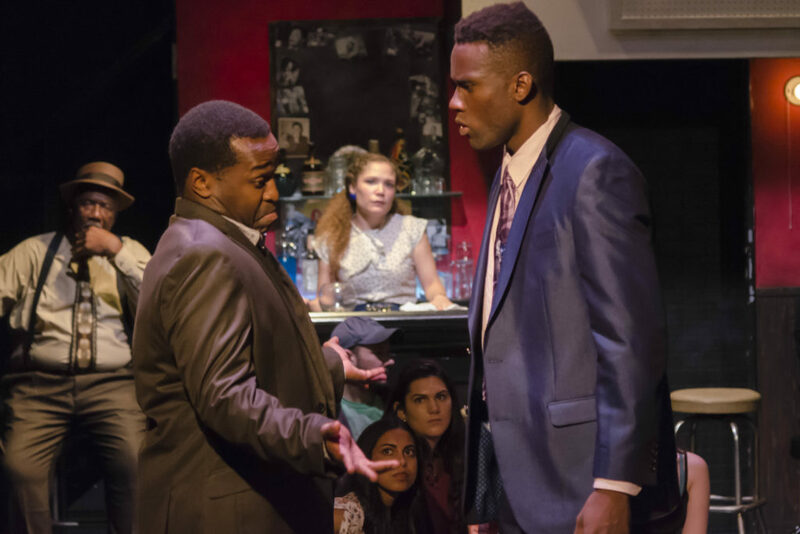 There’s a combo in the corner backing up actions on stage, but the fast-paced rhythm work of the cast through overlapping scripted monologues and memories cements the musical practices into the performance. It’s beautifully done how director Arciniegas uses Odle’s forms to turn spoken cacophony into organized memory phrases. Naysayers might call this production liberal propaganda. It should be taken as a compliment. Jazz is a major character in Lost Tempo. It’s a play with music, but the music is more than merely a soundtrack. It is the reason Cool Jones becomes abusive. It is what feeds his abuse. Robinson plays emotional trainwreck Cool with the respect a great musician deserves. He invites us to empathize with Cool but not to pity him. Cool believes that he needs drugs in order to play; We believe that he’ll never be whole enough to beat his addiction. Jeffrey Petersen transformed the BPT with his set. Mitzy’s required a complete overhaul of the space with working booth and club seating. Alas, the bar is not fully functional. The dramaturgy work by Odle and Jennifer Morris is top notch. Odle wrote a stirring note for the program that offers everything an audience member needs to know to prepare for the performance. One should still do the proper research before attending as complicated adult themes are tackled. The US is fighting the same damn fight it was fighting in 1964. Odle’s play shows us how very little has changed over the years. NFL players can’t take a knee without Pence whining that his rights are being violated by their peaceful protests. A la the 1950’s, it’s more important that everything look fine and dandy rather than point out that right now white lives matter more than Black lives. Meanwhile, it’s super convenient that a mere press conference was the clincher when it came to defeating drug abuse. But, you know, Hillary’s emails and stuff. UPDATED: More BS from the White House on the opioid epidemic. USDAC has a downloadable guide on resistance through art. This entry was posted in Drama and tagged 2017, Arthur Gomez, Boston, Boston Playwrights' Theatre, Charles Linshaw, Cliff Odle, Diego Arciniegas, Evelyn Howe, Jeffrey Petersen’, Kinson Theodoris, Lost Tempo, MA, Miranda Adekoje, Mishell Lilly, October, Omar Robinson, opioid epidemic by Kitty Drexel. Bookmark the permalink.